There is a new Sheriff in town and he is pulling out the back log of warrants and knocking on doors. The Grant County Sheriff has also kicked off the year with plans for safety check points. Normally you hear about a warrant sweep or a safety check point. But imagine in a town of 500, having both in one day. That was Friday, January 11 and it's still the talk of the town. Like the saying goes, if you blink you missed it. 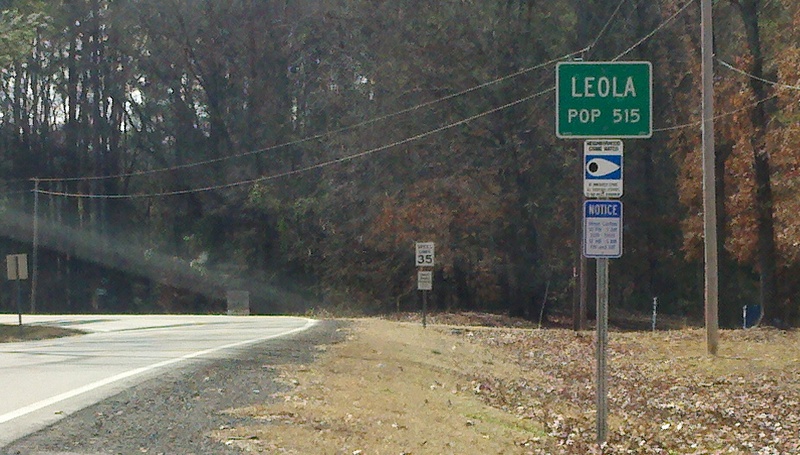 Leola is a small town where everyone knows one another. Gas station manager, Nancy Cooper says, "I was at the register and I just seen cop after cop and they went to both ends of the store." Seven law enforcement agencies (Arkansas State Police, Dallas County, Hot Spring County, Group Six Narcotics, Arkansas Game & Fish Commission, Grant County and the Highway police) worked together to barricade roads, in and out of Leola to conduct safety check points. Sheriff Ray Vance says, "We wrote over 25 citations just in our check points that range from anything from DWI to suspended license to expired tags." In the meantime, deputies went knocking on doors, looking for 17 people with outstanding warrants. "The success rate of this proves it is an effective way to do what we want to do." Sheriff Vance says the county has more than $1 million dollars worth of fines and fees that need to be collected. "In that one night we collected about $5,000 dollars." Sheriff Vance says this was just the first of many sweeps planned this year. "We may go back to Leola. Right now we don't know where we're going to go and neither does everybody else and that's a good thing and that's what we're hoping." A random checkpoint (also known as a "flying checkpoint", "mobile checkpoint" or "hasty checkpoint") is a military and police tactic involving the setup of a hasty roadblock primarily by mobile truck-mounted infantry or police units in order to disrupt unauthorized or unwanted movement and/or military activity. Random checkpoints are set up to achieve surprise, as opposed to known permanently located manned checkpoints. They might be established in locations where they cannot be observed by approaching traffic until it is too late to withdraw and escape without being observed. The Fourth Amendment to the United States Constitution states that: “The right of the people to be secure in their persons, houses, papers, and effects, against unreasonable searches and seizures, shall not be violated, and no Warrants shall issue, but upon probable cause, supported by Oath or affirmation, and particularly describing the place to be searched, and the persons or things to be seized.” This fundamental right has a tense relationship with sobriety checkpoints. At a sobriety checkpoint, drivers are necessarily stopped without reasonable suspicion, and may be tested summarily and without probable cause. Thus the Constitution would prohibit people from being stopped without a search warrant or at least without probable cause that they have committed a crime; however, the warrant requirement only attaches should the search be unreasonable and the Supreme Court, as shown below, decided that such stops are not unreasonable under certain circumstances. Driving under the Influence of alcohol is a special type of crime, as driving with a blood alcohol content (BAC) over a set limit is defined as the crime; it is not necessary to drive recklessly or cause an accident in order to be convicted. To determine BAC accurately, it is generally necessary for the driver to subject himself to tests that are self incriminating, and drivers sometimes exercise their right against self incrimination to refuse these tests. To discourage this, some jurisdictions set the legal penalties for refusing a BAC test to equal or worse than those for a failing a BAC test. In other jurisdictions, the legal system may consider refusing the roadside alcohol breath test to be probable cause, allowing police to arrest the driver and conduct an involuntary BAC test. The Michigan Supreme Court had found sobriety roadblocks to be a violation of the Fourth Amendment. However, by a 6-3 decision in Michigan Dept. 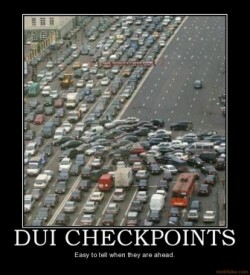 of State Police v. Sitz (1990), the United States Supreme Court found properly conducted sobriety checkpoints to be constitutional. While acknowledging that such checkpoints infringed on a constitutional right, Chief Justice Rehnquist argued the state interest in reducing drunk driving outweighed this minor infringement. Dissenting justices argued that the Constitution doesn’t provide exceptions. "That stopping every car might make it easier to prevent drunken driving...is an insufficient justification for abandoning the requirement of individualized suspicion", dissenting Justice Brennan insisted. Chief Justice Rehnquist argued that an exception was justified because sobriety roadblocks were effective and necessary. On the other hand, dissenting Justice Stevenscountered that "the findings of the trial court, based on an extensive record and affirmed by the Michigan Court of Appeals, indicate that the net effect of sobriety checkpoints on traffic safety is infinitesimal and possibly negative." Jurisdictions that allow sobriety checkpoints often carve out specific exceptions to their normal civil protections, in order to allow sobriety checkpoints. Although the U.S. Supreme Court has found sobriety checkpoints to be constitutionally permissible, ten states (Idaho, Iowa, Michigan, Minnesota, Oregon, Rhode Island, Texas, Washington,Wisconsin, and Wyoming) have found that sobriety roadblocks violate their own state constitutions or have outlawed them. Two other states (Alaska and Montana) do not use checkpoints even though they have not made them illegal. In approving "properly conducted" checkpoints, Chief Justice Rehnquist implicitly acknowledged that there must be guidelines in order to avoid becoming overly intrusive. In other words, checkpoints cannot simply be set up when, where and how police officers choose. As often happens in Supreme Court decisions, however, the Chief Justice left it to the states to determine what those minimal safeguards must be, presumably to be reviewed by the courts on a case-by-case basis. Decision making must be at a supervisory level, rather than by officers in the field. A neutral formula must be used to select vehicles to be stopped, such as every vehicle or every third vehicle, rather than leaving it up the officer in the field. The site should be selected by policy-making officials, based upon areas having a high incidence of drunk driving. Limitations on when the checkpoint is to be conducted and for how long, bearing in mind both effectiveness and intrusiveness. Warning lights and signs should be clearly visible. Length of detention of motorists should be minimized. Advance publicity is necessary to reduce the intrusiveness of the checkpoint and increase its deterrent effect. Centers for Disease Control and Prevention, in a 2002 Traffic Injury Prevention report, found that in general, the number of alcohol-related crashes was reduced by 20% in states that implement sobriety checkpoints compared to those that do not. Public Health Law Research, an independent organization, reported in a 2009 evidence brief summarizing the research assessing the effect of a specific law or policy on public health, that there is strong evidence supporting the effectiveness of selective breath testing sobriety checkpoints as a public health intervention aimed at reducing the harms associated with alcohol impaired driving. The debate regarding saturation patrols versus checkpoints favors saturation patrols being more effective, both in terms of number of arrests and cost. The FBI compared saturation patrols vs. checkpoints in Ohio, Missouri, and Tennessee. The study showed that, “Overall, measured in arrests per hour, a dedicated saturation patrol is the most effective method of apprehending offenders.” Another survey found that "States with infrequent checkpoints claimed a lack of funding and police resources for not conducting more checkpoints, preferred saturation patrols over checkpoints because they were more 'productive,' and used large number of police officers at checkpoints."